Retirees today face bigger financial challenges than that if they have to juggle their 401(k) investments and withdrawals. This is a change from the days when an employer simply issued a check every month from the defined-benefit pension plan, said Laura Bos, AARP’s acting vice president of financial education and outreach. Older people “have to be more savvy these days,” Bos said. Now the good news: there is fresh evidence that when people get older they in many ways get better. New research out of Denmark published in The Lancet followed people in their 80s and 90s and found that 32 percent of men born in 1915 scored the maximum on a test of their attention level, memory, and word fluency – they outperformed men born 10 years earlier, indicating significant improvements from one birth cohort to the next. A study of older U.S. workers found that they are more educated than previous generations, and this has helped to make them just as productive as people in their prime working years. More educated people also have higher financial literacy. And while cognitive ability declines with age, research has also established that this may be somewhat offset by – for lack of a better word – wisdom. All Americans have poor financial literacy but with age and experience, investors acquire critical knowledge. Younger people, for example, are much less likely than older people to view individual stocks as riskier than mutual funds. 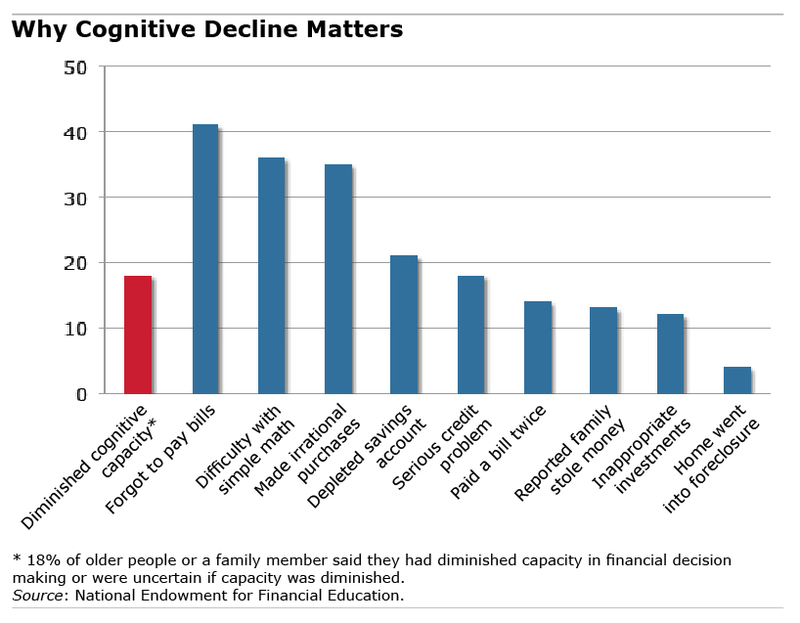 The research will continue, but perhaps it’s time to move past thinking simply that age necessarily leads to impaired financial decision-making. The issues are more complex than that. Very important issue. Older people are very susceptible to scams too my Grandpa was basically robbed of alot of his savings luckily we have a great police force and since my Grandpa was on the force he even helped track them down.